Common sense recommends that you not fry doughnuts in your kitchen when it's 82 degrees F out or when you're planning to attend a rather technical philosophy talk in a few hours or when the only ventilation in your kitchen is an open window. It also recommends that you not down four or five such doughnuts (as modestly sized as they might be) within seconds of one another. But some considerations tend to drown out that sober, well-meaning voice in your head--for example: grapefruit-jelly doughnuts! Just the idea of them--it's like bells ringing in your head. It chimes and crashes 'til you wake up one day thinking, "Common sense--what's that?" and then find yourself juicing grapefruits in the kitchen. So it was under the spell of these doughnuts that a few friends and I gathered in my sweltering, cramped kitchen this past week, dropping bits of brioche dough into hot, shimmering oil to have them sizzle, puff, and blister golden. It got pretty sticky and greasy in there, but that didn't matter to us. Warm doughnuts filled with grapefruit jelly--the idea kept us going. And when we were through, those first few minutes were glorious. We stood there together in the thick air of the kitchen, just eating. We reached for one doughnut, then another, then another. Whatever sense we had had left us. We blissfully gorged ourselves. It was not, perhaps, our finest moment. Five or six doughnuts in, we started to feel the grease on our fingertips, the sugar going to our heads, and had to stop ourselves. But I maintain that those first few minutes were glorious. The aftermath--not so much. Octavian and I, anyway, were headache-stricken and drowsy for the remainder of the day. Doughnut coma is a phrase that comes to mind. But I don't mean to discourage you from making your own doughnuts at home. It's a good way to spend an afternoon with friends (you should just round up more than I managed to to help you with the eating), and these doughnuts are really good. Make a party of it. Your friends will thank you. That said, making these doughnuts in particular does require a bit of planning ahead and a few extra hands (remember those friends?). It's easiest, I think, to spread the work over two days. On the first day, you should put together the brioche dough. This is my favourite part. You start by mixing together a basic yeasted dough. Then you add butter, a lot of butter, to the dough, bit by bit, until it's satiny and yielding. This process takes a while, and you may find it tedious, but I am all for the waltz of dough and butter whirling around the bowl of my stand mixer. I find it mesmerizing. 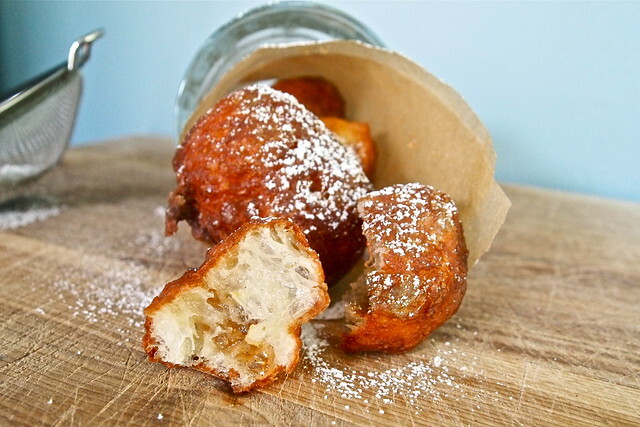 Brioche dough is not typically what you'd use for jelly doughnuts. By weight, the butter-to-flour ratio in brioche ranges from 1:2 to 4:5, which makes the dough far richer than what you find in most doughnuts. But this, I think, makes these doughnuts all the better--airy, delicate, meltingly tender. (I wouldn't have thought to do this myself. I came across the idea in Tartine Bread.) And the grapefruit jelly does help tame some of that richness. You should make the jelly on the first day too, if not beforehand. It's a cinch and can be made well in advance (I made mine several weeks ago, when it was still legitimately grapefruit season)--just transfer it to a clean jar and store it in the freezer until you need it. So, these doughnuts do call for a good deal of effort, and many of them will disappear into your friends' mouths seconds after you've put your pastry bag down. But I can think few better things to do with friends when you've got an afternoon. Note: About the grapefruit jelly. The first time I cooked the jelly, it didn't set. I failed to note the importance of using a large saucepan. If this happens to you, just return the mixture to a large saucepan and bring to a boil. Let it boil for 3-4 minutes and pour it back into the shallow dish. You do not need to let the jelly reach 220 F while on the stove--it will set too hard if it reaches this temperature. If the jelly has set too hard, return it to a saucepan and cook over medium heat. Add up to 1/2 cup more of fresh grapefruit juice and whisk to incorporate. Bring it to a vigorous boil and then pour it back into the shallow dish to cool and set. And if you find yourself with extra jelly, it's wonderful on toast. About the brioche dough. I used Tartine Bread's brioche recipe for my doughnuts, which involves using sourdough starter and poolish for leavening. I'm pretty confident, however, that just about any brioche dough with a similar butter-to-flour ratio, 1:2, will produce good results. I like this Dorie Greenspan recipe. You might also consider using this brioche dough (but without all of the savouries, of course). Or, if you have Peter Reinhart's Bread Baker's Apprentice, you could also use his recipe for "middle-class" brioche. Whichever recipe you settle on, it will most certainly make more dough than you'll want for doughnuts. Scale the recipe and portion out the dough so that you have just as much as you need or bake a loaf of brioche with the extra like I did. Follow your chosen recipe's directions up to and including bulk fermentation (the first rise) and then chill the dough (for up to a day) until you're ready to follow the procedure below. About the safflower oil. Depending on the size of the pot in which you're deep-frying, you may need up to 1 quart of oil. Once you've finished the frying, you can let the oil cool and then filter it through a fine-mesh sieve or a coffee filter to get at least one more use out of it. Store it in the fridge until then. 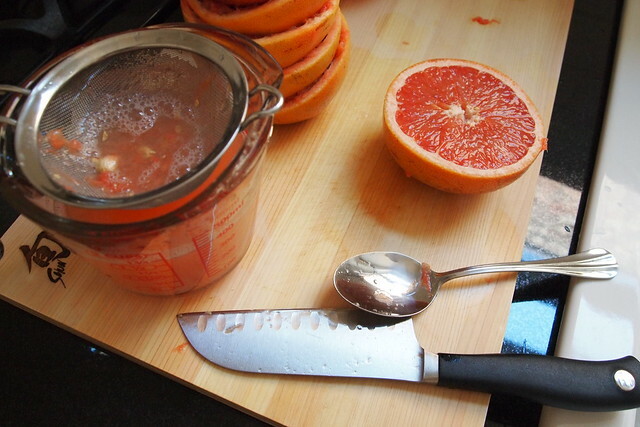 Make the grapefruit jelly. 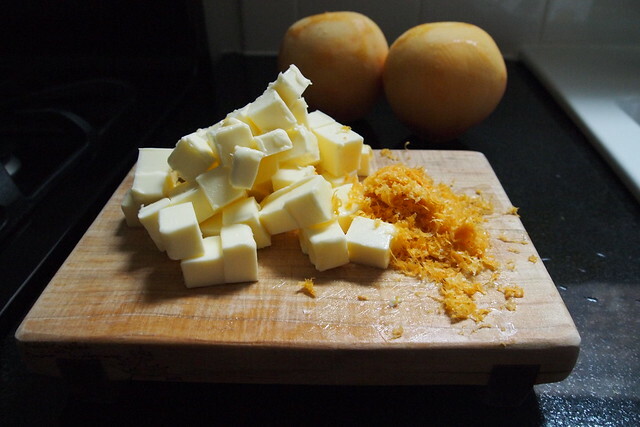 Combine the sugar, grapefruit juice, and pectin in a large saucepan (the mixture tends to foam as it heats up--a larger saucepan will allow it to properly boil and release enough of its water content to set into a jelly). Scrape in the seeds from the vanilla bean and add the pod. Cook over medium heat, stirring, until the sugar dissolves. Increase the heat to high and whisk until mixture boils vigorously, about 6 minutes. Pour mixture into a shallow, heat-proof dish. Remove the vanilla bean pod. Let cool completely at room temperature. Cover and chill until set, at least 2 hours. The jelly should have a consistency similar to preserves--thick enough to cling to the end of a spoon. The jelly can be made up to a week in advance (or earlier if stored in the freezer in a clean jar). Shape the doughnuts about 2 hours before serving. Lightly flour the dough and the work surface. There are two options for shaping the dough. (i) divide the dough into 3 equal portions and roll each portion into a cylinder about a 1/2 inch in diameter. If the dough feels as if it will not stretch further, let it rest for 10 minutes and continue rolling. Transfer the dough to a cutting board and set in a draft-free place or cover with a kitchen towel. 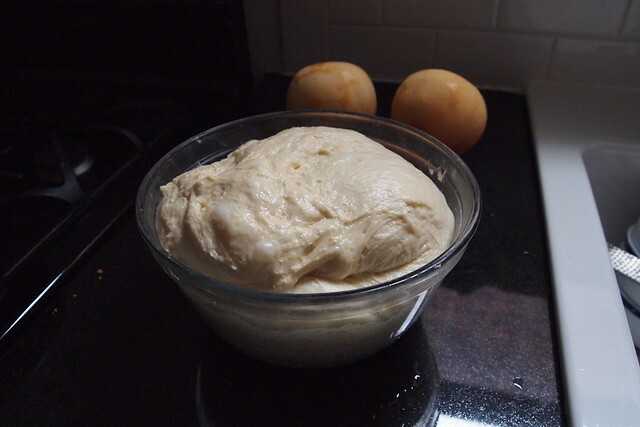 Let rise until the dough looks soft and inflated, 1 to 2 hours. Cut the dough into on the diagonal into pieces about 2 inches long or as you prefer and then place near the stove. (ii) Roll the dough out to a thickness of 1/2 inch. Cut circles out the dough with a biscuit cutter. Transfer the circles to two lightly floured half-sheets and set in a draft-free place or cover with a kitchen towel. Let rise until doubled, 1 to 2 hours. Place near the stove. Pour oil into a heavy, high-sided pan to a depth of 2 to 3 inches. Heat the oil over medium-high heat until it registers 375 degrees F on a deep-frying thermometer. When deep-frying it's best to set up your prep area like an assembly line so you can work safely and efficiently. Set a rack near the stove and under it place a layer or two of papers towels. Carefully slip four pieces of dough into the hot oil and fry until golden brown, about 1 minute. Using the slotted spoon, turn the dough and fry until brown on the second side, about 1 minute. Carefully remove the doughnuts from the oil and transfer to the wire rack. Fry the remaining pieces of dough, checking the temperature of the oil intermittently. If necessary, allow a couple of minutes for the oil to return to 375 degrees F in between batches. 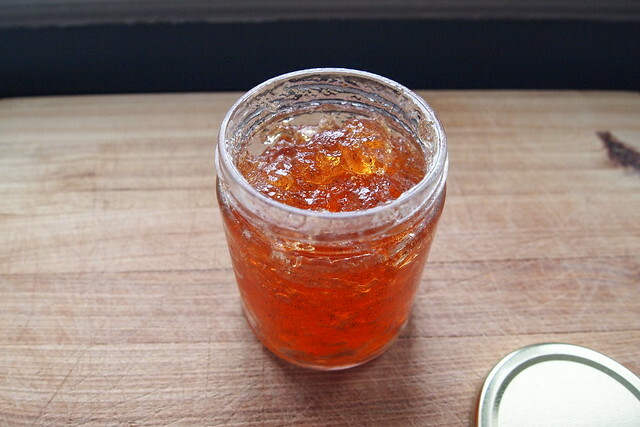 Transfer the grapefruit jelly to a pastry bag fitted with a Bismarck tip. Filling the doughnuts is a two-person job--you need one set of hands to hold the pastry bag upright and to pipe out the jelly and another set of hands to insert the Bismarck tip into the doughnuts. A squeeze bottle fitted with a 1/4-tip would also work. Fill each doughnut with about a 1 teaspoon of jelly. 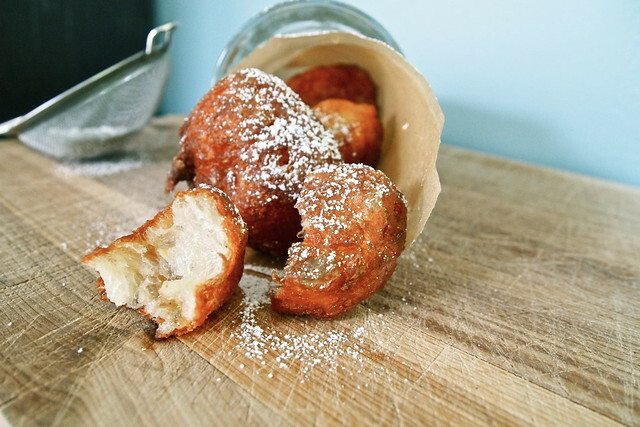 Dust the doughnuts with powdered sugar and serve immediately. Oh yesss I was hoping when I saw that tweet of yours that you have been making doughnuts. They're my favorite food (I think--Lena if you're reading this comment I change my my favorite treat from lemon bars to doughnuts). I really want to make them from scratch too, but I obviously have a lot to learn... I wasn't aware of the different types of doughs for making them. My only experience in looking at doughnut recipes is from Smitten Kitchen and I'm pretty sure she doesn't use any leavening, let alone yeast. I guess these are more buttery-bready? Anyway I guess I have a lot to research! Thanks for posting these--so inspiring! But these really do sound great. I truly wish I could have been there (or any kitchen making doughnuts!) to experience that glory a bit. Amy, I wish you could have been here too. We could have used your help! You're right--there are two kinds of doughnuts, cake doughnuts and yeasted doughnuts. The difference, I guess, is pretty self-explanatory. Cake doughnuts are usually the ones that have been glazed with a sugary coating. Yeasted doughnuts are typically dipped in fondant or filled with jelly. I think the doughnuts covered in rainbow sprinkles that I liked as a kid were yeasted. This is how things are at the major doughnut chain in Canada, anyway--my first weekend job in high school. These doughnuts in particular are less bread-y than other yeasted doughnuts because of all that butter. You can see in the photos that their crumb is a lot more open. I get the feeling that the SK doughnuts would be a breeze to make now that I've made these--there'd be less to coordinate anyway. This is all kinds of wonderful. I love the image of you in a hot kitchen standing over the frying oil stirring / flipping with one hand and eating a doughnut with the other. The addition of grapefruit jelly is an interesting one, and certainly sounds delicious. My dad loves jelly doughnuts, with the typical red raspberry jelly, but he also loves grapefruit juice so perhaps I'll have to try out this recipe the next time I'm home, or he is here. The brioche dough intimidates me...do you have starter and poolish on hand? Are you feeding a little starter baby over there in Chicago? (I think you are based on other posts, and I'm guessing you even posted about it and now I'm forgetting). I'm curious to know how it's going. I keep meaning to start that project, but always get scared away. Any tips? Talley, if you do end up making these doughnuts for your dad, I would recommend cutting down the recipe by a lot. I don't think I'd ever use 700 g of brioche dough for doughnuts again unless I was expecting at least 15 people to show up and help me with the eating. All that butter can hit you pretty hard. Poolish is made with commercial yeast, water, and flour, so that's easy to put together. It's the sort of thing you mix the night before and then leave in the fridge overnight to do it's thing. 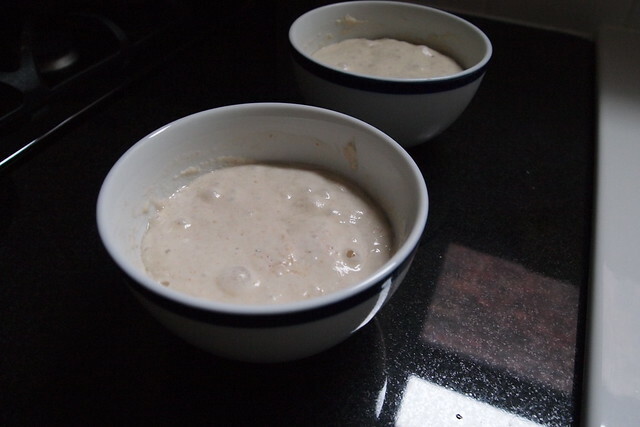 As for starter--yes, I do have my very own sourdough starter. I didn't actually start it myself. Another grad student in my department did and passed some on to me. So, unfortunately, I don't have any advice to offer about starting your own starter. Do you have the Tartine Bread book? I think that it has detailed instructions. Maintaining starter is really easy, though. I keep a small quantity in the fridge, and the day before I want to make some bread, I will discard about 80% of it and then refresh/feed it with equal parts water and flour (50 g each). I really like the Tartine method because (a) it makes extraordinary bread and (b) you don't need to feed your starter tons and tons of flour because you only need a small amount to start your bread, so you don't feel like you're wasting a lot of flour. Starter is pretty forgiving--I leave mine in the fridge when I leave town for 2 or 3 weeks, and it just takes a couple of feedings when I return to bring back to its normal, bubbly self. And if adding that much butter to dough that's going to be deep-fried intimidates you, the link to the Bon Appétit recipe above has a recipe for non-brioche doughnut dough. I haven't tried it out, but I'm curious about it. It has apple juice in it! Katie! Thank you. It is really good to know that you can abandon the starter for a few weeks and it won't die on you. This is definitely inspiring. I do have the Tartine Bread book and I've looked through it about 9837598345 times and have contemplated starting a starter just about as many times, but always back down for some reason. I even bought a kitchen scale and thermometer just for that purpose but backed down at the last minute. I'm going to start a starter tomorrow, so it can be healthy and raring to go by the time i leave for three weeks in June. That's wonderful! I'm excited for you. Love your post, as I do doughnuts and the tart sweetness of grapefruit. Sullivan Street Bakery in NY makes a wickedly rich brioche that's so rich it's doesn't even taste stale the next day. 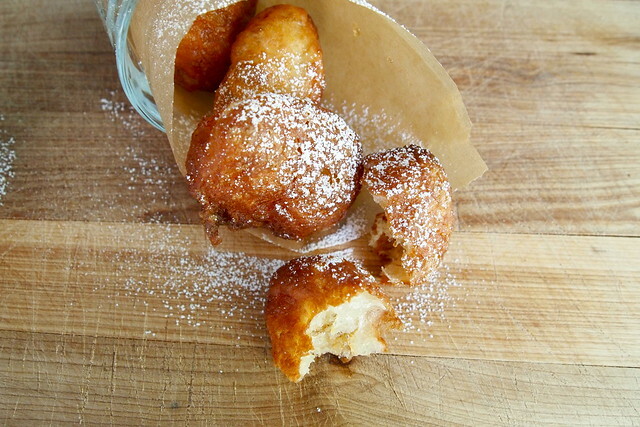 They also fry it up and fill it with vanilla bean pastry cream for bombolonis. Your post brought back memories. Thanks, Tiffany. You know, I've never made it to Sullivan Street Bakery on my trips to NYC. I'm usually too busy on the Lower East Side stuffing my face with ramen noodles or something. I will have make my way there the next time I'm visiting. Bomboloni sound fantastic! These doughnuts don't really get stale the next day either. They're a little soggy on the outside but certainly not dry when you bite into them. I could relate to your whole experience ... from the donut coma ... to the initial jelly mishap. (Definitely something that would happen in my kitchen.) The grapefruit sounds like such a lovely pairing for the brioche. And they look absolutely delicious! I am thinking I really need to get my hands on Tartine! I've been wanting it for awhile now. Oh my, these look absolutely drool-worthy. I limit myself from making doughnuts to few and far between because it usually ends with eater's remorse! These will be the next recipe to try though- thanks for posting! Wow! This is so inspiring. I'm gonna doughnut the heck out of my Sunday now. Thank you for sharing!